Desktop RoboTurret V3 Getting Started Guide. Includes assembly guide, downloads, and programming instructions. 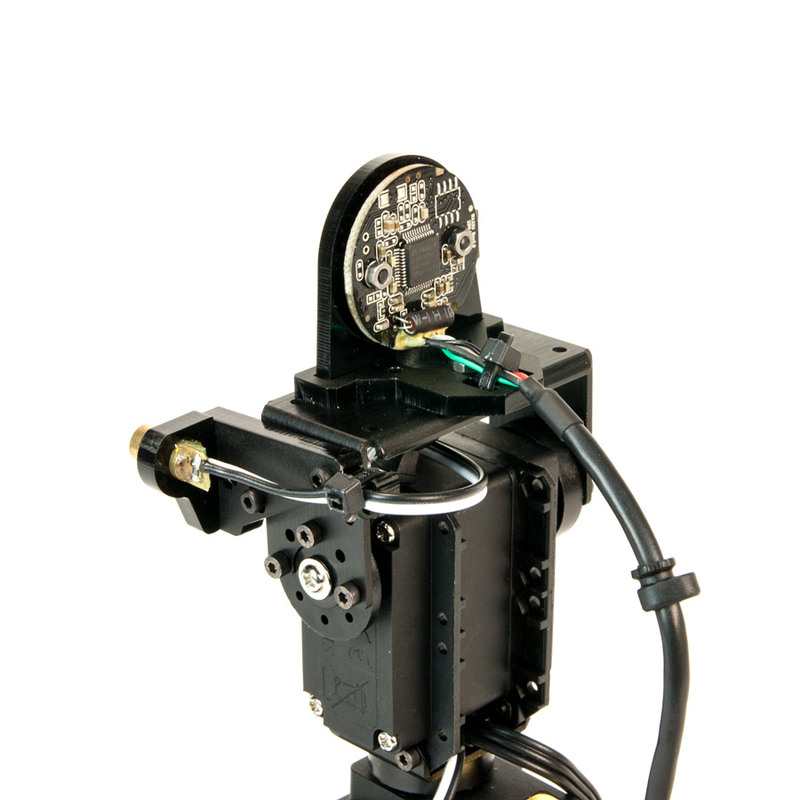 The RobotGeek Desktop RoboTurret is the latest in our line of RoboTurrets. 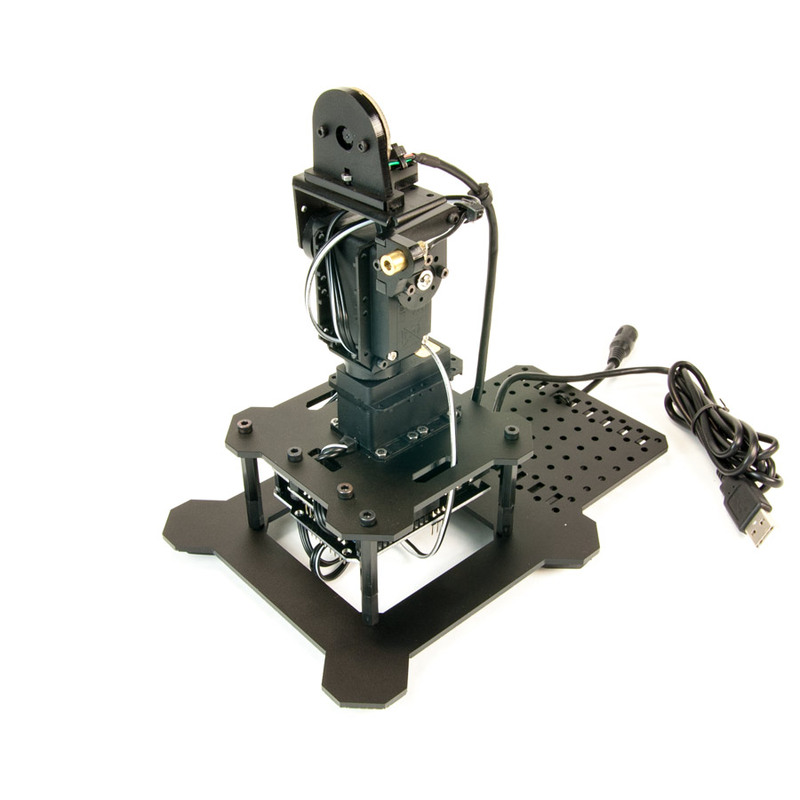 The Desktop RoboTurret is an Arduino based robotic platform that makes it easy to get started in the world of robotics! Whether you're completely new to Arduino or you've got a few Arduino project under your belt, the Desktop RoboTurret is an amazing platform to build robotic projects on. The Desktop RoboTurret's documentation will introduce you to robot servos, sensors, and basic robot behavior. The Arduino Platform is a powerful tool for physical computing. The open source Arduino IDE application will easily allow you to write, debug, and load code onto your Arduino compatible microcontroller. By connecting sensors, motors, and output boards to your board you can create a variety of electronic projects. 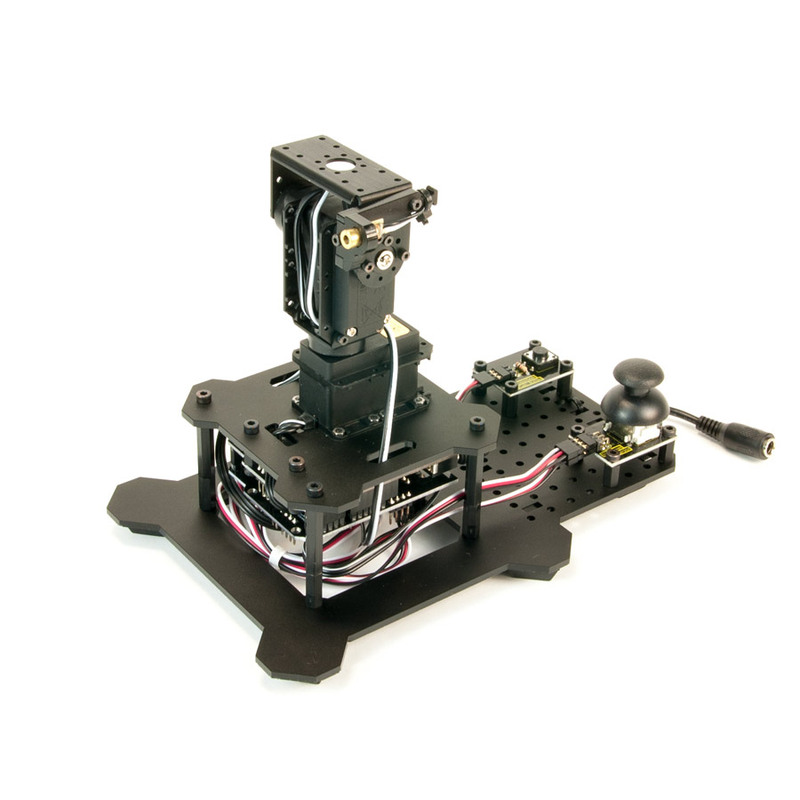 The Desktop RoboTurret comes with everything you need to build a Pan & Tilt Robotic Turret quickly and easily - no soldering or breadboarding required. 2x RobotGeek 180° Robot Servos. 1x RobotGeek Joystick & Cable. 1x RobotGeek Pushbutton & Cable. Turret Plates, Hardware and Tools. This kit uses our new RobotGeek 180° Robot Servos, giving you over twice the torque then previous versions of the RoboTurret! Not only do these servos have more power, but they also use the RobotGeek Servo Rail System. 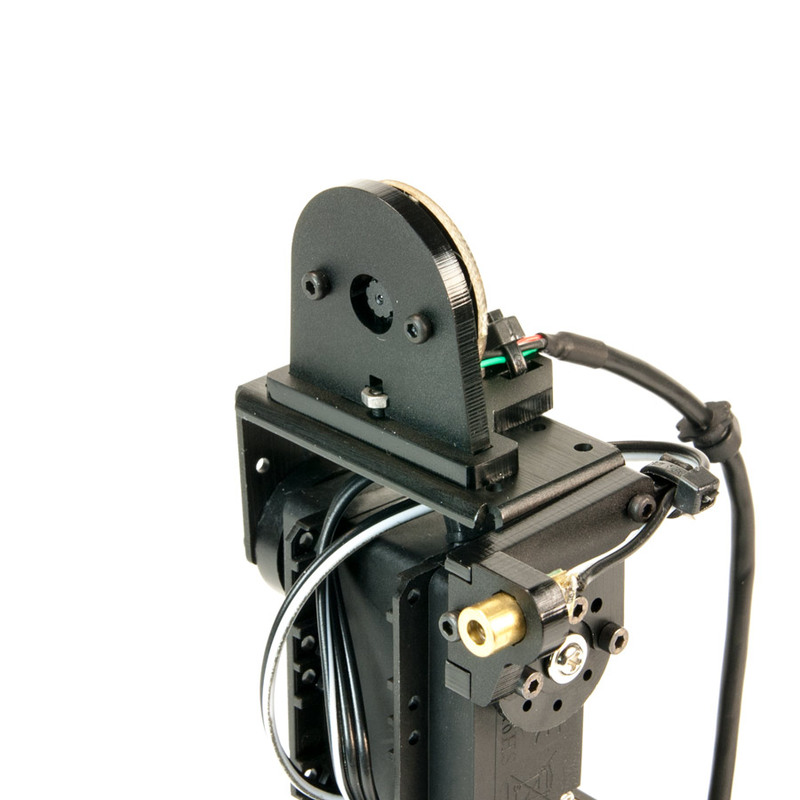 These mounting points on the servos give the kit a more stable base, as well as make it easier to add brackets and custom plates onto your project. Using the included RobotGeek Joystick and RobotGeek Pushbutton you can get started controlling your turret right away! Just assemble your turret, load the demo code, and you'll be controlling your RoboTurret in no time. The RoboTurret also comes with a Laser that can be mounted on your RoboTurret so you can see where the turret is pointing at a glance. 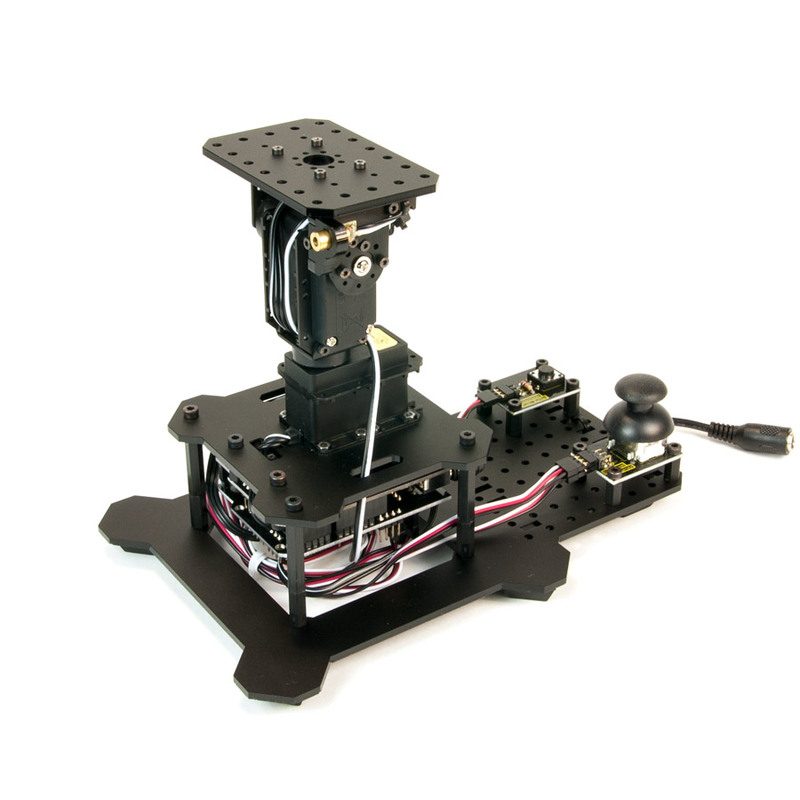 The new Desktop RoboTurret uses the RobotGeek Sensor Shield, making it easier than ever to add more servos, sensors and output boards to your RoboTurret. Just pick any of our RobotGeek I/O boards and attach it directly to the SensorShield using a 3-Pin sensor cable. The bottom plate of the new RoboTurret has a mounting grid designed especially for the RobotGeek I/O boards. 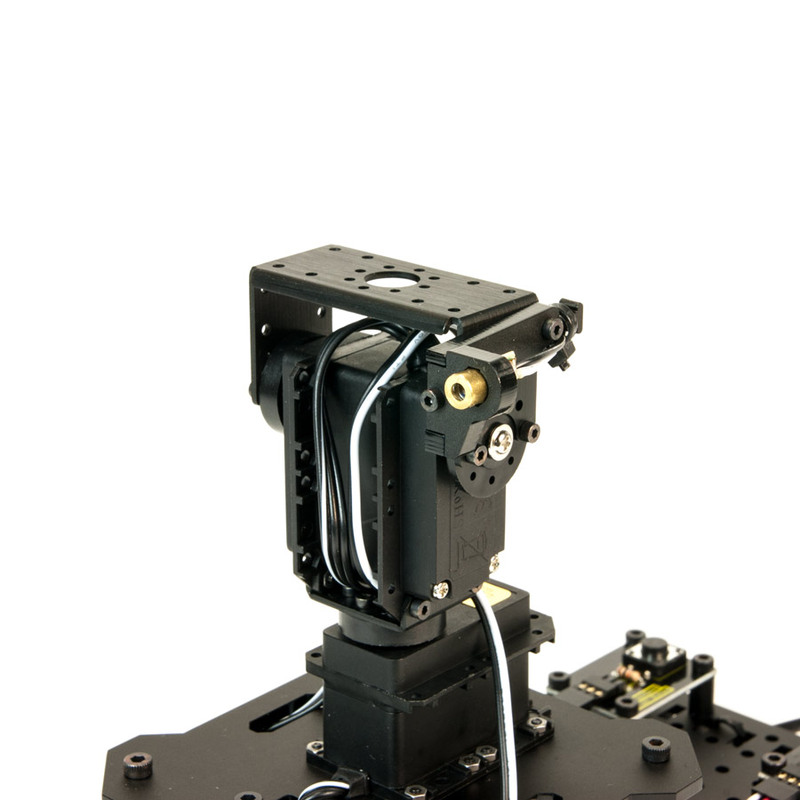 This mounting pattern makes it easy to keep all of your sensors positioned exactly where you want them. You can also easily attach a wide variety of Grove, Electronic Brick, Phidgets and other sensors to the Sensor Shield using various adaptor cables.